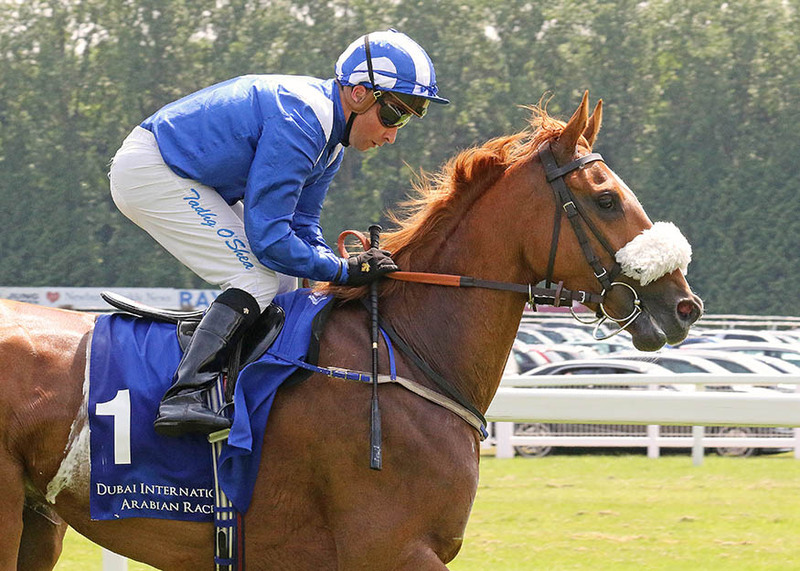 9 June 2016, UK ~ The first of four UK preparatory races for the Arabian Racing Organisation’s flagship meeting Dubai International Arabian Races (DIAR) was run at Newbury today, 9 June, with recent ARO Cup (Gr3PA) winner Aghsaan dominating the finish to win going away by four lengths. Ridden again by Tadhg O’Shea for Phil Collington, she easily dispensed with the early pacesetter Alcea Rosea with her stablemate Naar running on for third. The five-year old is a product of DIAR patron HH Sheikh Hamdan bin Rashid Al Maktoum’s Shadwell Estate, who also stands her sire Al Jakbar under the Shadwell Arabian banner at Beech House Stud in Newmarket. The race is the first of four UK preparatory races leading up DIAR, also staged at Newbury, on 24 July. It was run over the same mile and a quarter as the Dubai Duty Free Hatta Stakes (Gr1PA) which is also exclusively for fillies and mares and is the likely next target for the winner. However she also holds an entry in the Shadwell Dubai International Stakes (Gr1PA), a race that was won by her dam in 2000. The DIAR committee inaugurated a bonus scheme last year, which has been extended this season to reward any horse who finishes in the first three of a designated warm-up race, that then goes on to win one of the bonus races on 24 July. The bonus races are headed by the Shadwell Dubai International Stakes (Gr1PA), the Dubai Duty Free Hatta International Stakes (Gr1 PA), the Emirates Equestrian Federation International Stakes (Gr2PA) and the Rotana Resorts and Hotels Premier Handicap Stakes (UK domestic horses only).